This procedure guide is primarily intended for persons associated with or working with the LRTC Emergency Response Team. However, this information may be useful to other groups or private individuals who may wish to prepare for emergency activities involving horses and other large animals. Everyone working with large animals and rescue equipment during training and actual emergency conditions should always exercise common sense, caution and safe practices. The descriptions provided below are for basic orientation and familiarization and are not a substitute for personal responsibility when working with and around large animals and specialized equipment. Note: We will be adding a couple of 9/16 inch wrenches to the inventory to permit unbolting of clamp type panels in circumstances where rescue trailers cannot back up to existing gates and alleys. "Ammo box" supplies. The ammo boxes are mounted near the rear trailer gate latch. The following loading options are used when conditions or horse behavior (including feral behavior and/or lack of willingness to load) make it unwise to load a horse in an open area. The triangle load is configured using two loading chute panels, one panel securely attached to each rear corner of the trailer using chains from the ammo box. The horse is led between the panels, which are quietly swung together and secured. Once the triangle is closed, nearly all horses will enter the trailer when asked once they recognize that they cannot back away. Depending on the horse we may lead the horse into the trailer or send (drive) the horse in. If during a lead-in operation the horse appears to be becoming disturbed or unstable, the handler can exit the triangle and the horse can be driven into the trailer from outside the panels through proper use of construction netting or one or more flags. 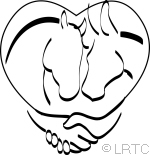 However, care must be used to control the amount of energy being directed at the horse and rescuers have to observe how the horse is responding or reacting to this energy. A confined horse that is unfamiliar with loading and that has not had a chance to recognize that he can proceed forward can become extremely volatile. Set up the loading configuration to be successful, then watch for the most opportune time to send the horse forward. Statistically the most reliable approach with a gentle, domestic horse is for the handler on the lead line to suggest that the horse move forward while one or two people in safe positions discourage the horse from backing away. The balancing point here involves generating movement from the horse without triggering an opposition reflex. Countless times lead-in loads that appeared doomed to fail became successful when the person on the lead simply stopped puling on the horse! Animal services officers adjust the panels while a volunteer loads the horse. For additional security it may be necessary to construct a chute between a corral or barn alley and the rescue trailer. In such instances the chute panels must be secured at both top and bottom at the ends distant from the trailer, such as by chaining or tying to facility corral panels or other fixed objects. It is critical that proper support be provided to maintain stability of the panels if a horse presses against it. 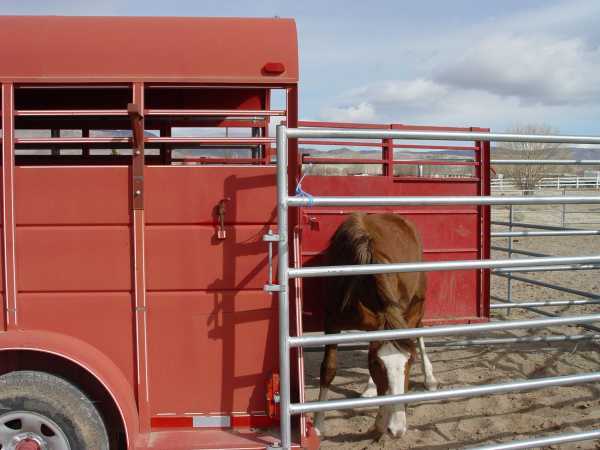 If the horse balks at the trailer and the situation permits it to be done safely, the chute panels can be released at the far end and swung together to form a triangle. This evolution must be performed by two people. If the horse becomes volatile, the volunteers controlling the panels need to be prepared to swing them back open and allow the horse to return to the corral if there is any indication that the horse might push a panel over a volunteer. 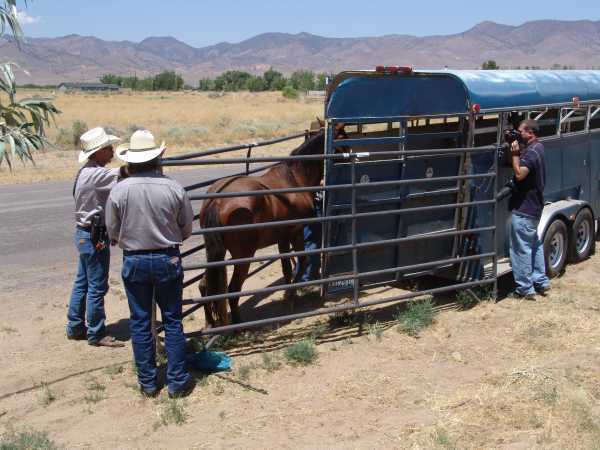 If the chute is located at a corral gate, the gate can be closed behind the horse, and loading continue after the horse has had a short while to settle and will look inside the trailer. The following images are from an actual rescue. Trailer positioned. Horse secured in chute. Corral gate closed. The horse loaded a few seconds later once she settled in the chute. 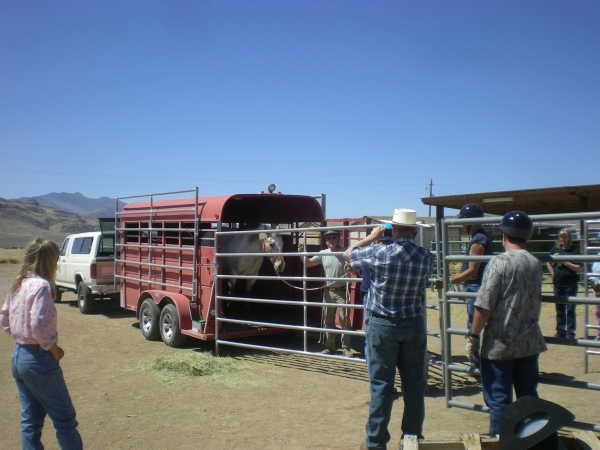 There can be instances where a formal chute is not required but a panel is desired to create a screen between horses being loaded or unloaded and distracting activity. In these instances a panel or two can be quickly deployed to guide the horse towards the trailer or towards an unloading pen. Guiding a horse towards a corral using a screen panel. We encounter instances where we have to load horses that are either not tame or are too agitated to safely halter. 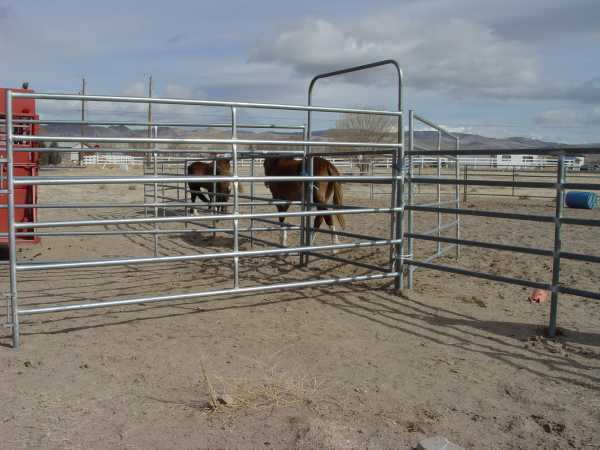 In those instances we typically set up a standard loading chute at an existing corral gate, and deploy one or two panels at an angle inside the corral to act as a cut-off screen and direct the horse or horses into the chute. This configuration was set up to load an injured feral horse. Three horses were actually in the corral. Once the trailer was in place and the gate opened, the horses were moved counter clockwise and the screen panel funneled them into the chute. The two uninjured horses were allowed to return to the corral and the corral gate was closed behind the horse that needed treatment. The screen panel can be seen in the corral in the right side of the image. Safe and Sure Rapid Horse Loading. Note: Rapid haltering techniques will be presented shortly. The training information presented in these information sheets and guides is offered for illustrative and volunteer refresher purposes only. It is not a substitute for actual hands-on training. 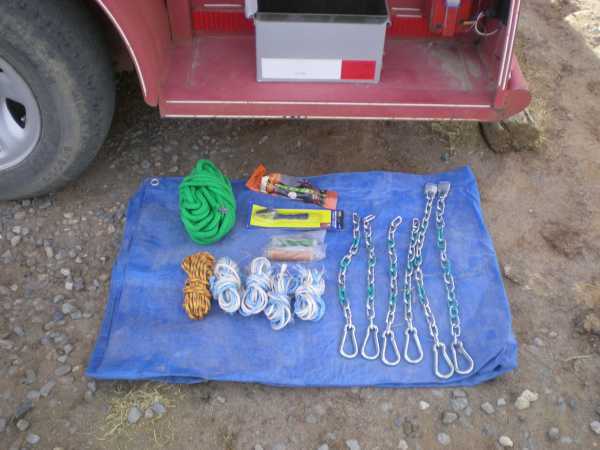 Equipment was provided by the Nevada Division of Emergency Management and Least Resistance Training Concepts. Funding for much of the training and equipment shown was made available through a grant obtained by the Nevada Department of Agriculture. For more information about training opportunities, please contact LRTC via email.